The kids in Cambodia can spot a foreigner from a mile away. Every few minutes while riding, we’d hear a “Hello! !” from inside a house or from a field next to the road. Often we wouldn’t even see where the voice came from, but we’d wave and shout back anyway. When we spoke with a local guy about Cambodia, he held out his cupped, upturned palm to demonstrate its geography. It’s flat and low in the middle, with hills around the edges. 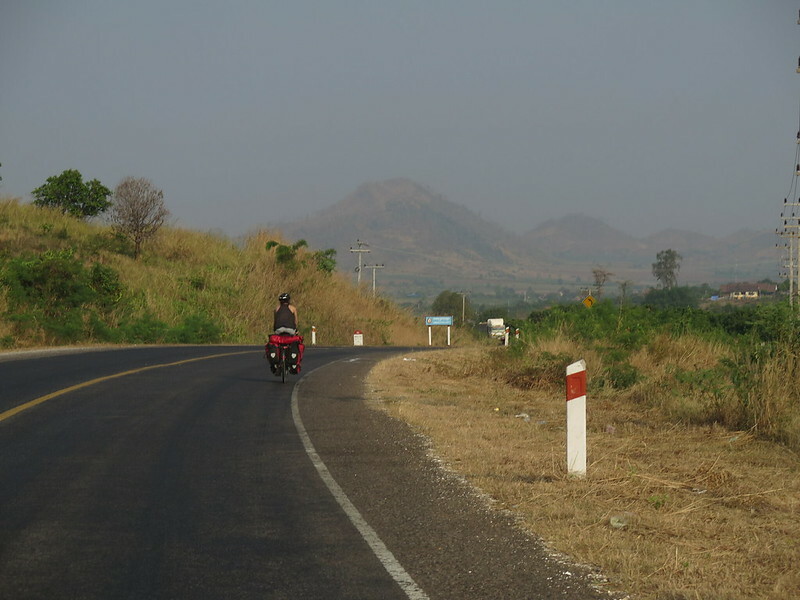 Getting towards Pailin, we reached those hills. Nothing too steep, but a fairly consistent climb for the last 30km of the day. It was another tough day with our bodies still not fully used to the heat and our legs definitely lacking the strength they had before our break. 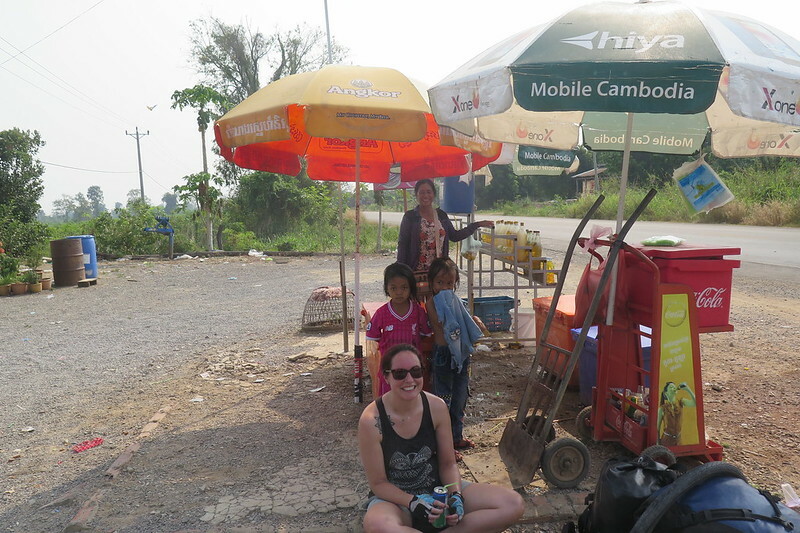 A nice downhill boosted morale and had us coasting into dusty Pailin soon after 11:00. We got a room at the Ruby Guesthouse, one of the few places available, grabbed a great lunch of Khmer fried chicken and rice, then retired to our cool room until later in the day. 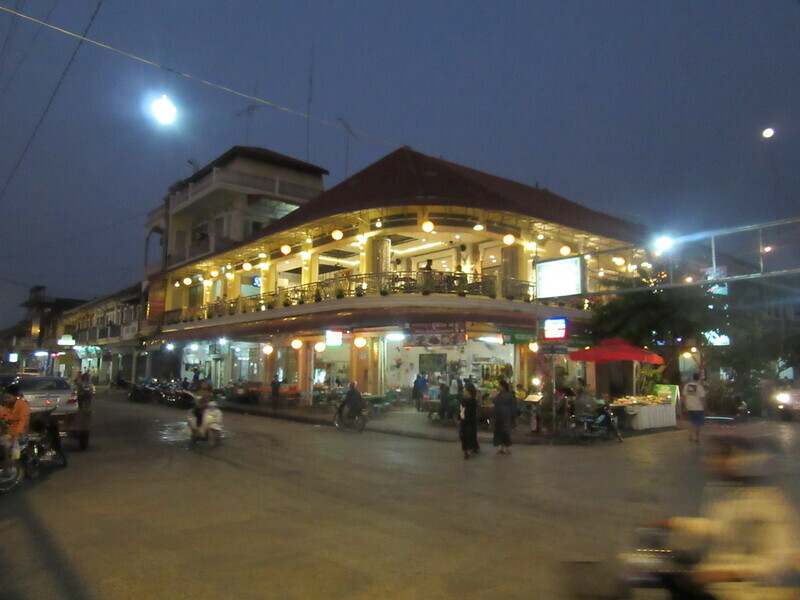 Although it didn’t seem to have much else going for it, the food we had in Pailin was really excellent. Our dinner from a small restaurant, and our lunch from earlier were probably the two best meals we had. 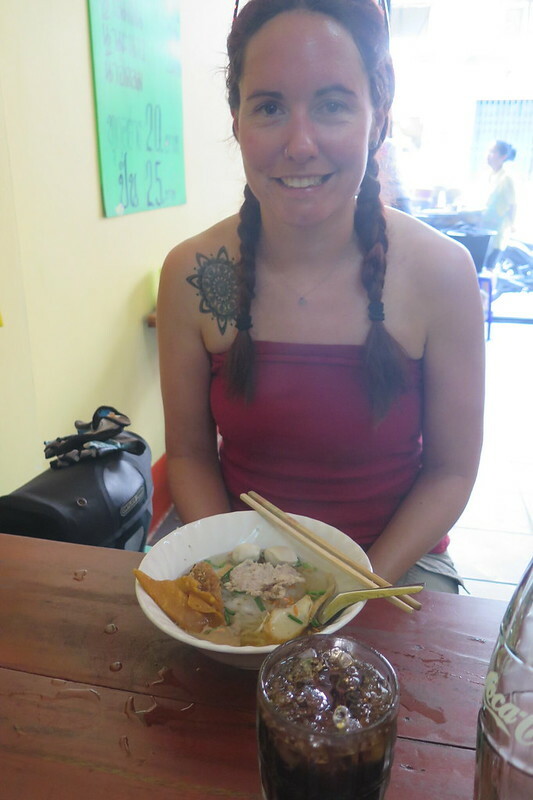 The food in Cambodia in general has been good. There doesn’t seem to be the variety (if you discount the insects!) that you’d see in Thai or Vietnamese cuisine, but the flavours are amazing and I can’t remember having a single bad meal when we were there. The ride to the border crossing the next day was only 17km. 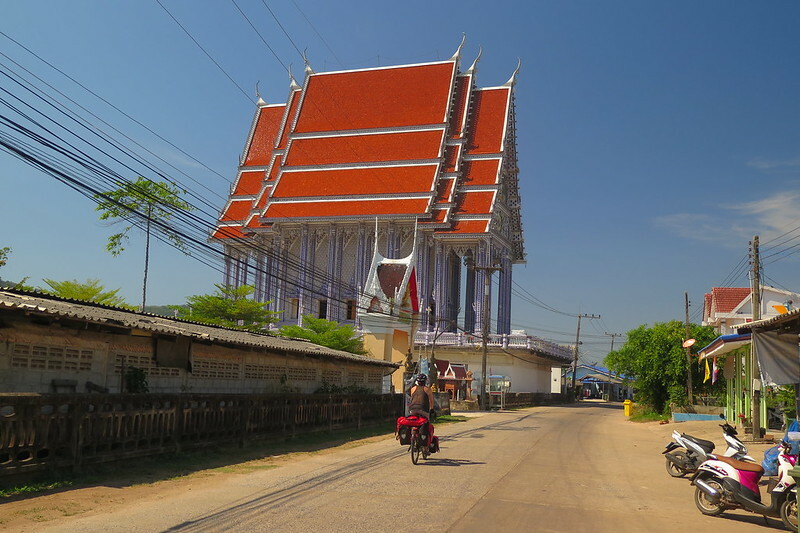 A lot of it was up hill so it took us the best part of an hour before we arrived at the collection of casino hotels and small guest houses clustered alongside the road just inside Cambodia. The border crossing was as simple as we expected. An exit stamp from the Cambodian side, then a short cycle down the road over a bridge crossing a stream, denoting the border. At the Thai checkpoint, we filled out an arrivals card and our passports were stamped for 30 days, visa free. We had a quick drink, I swapped my mirror over to my right handlebar and we set off into a new country, riding on the left. 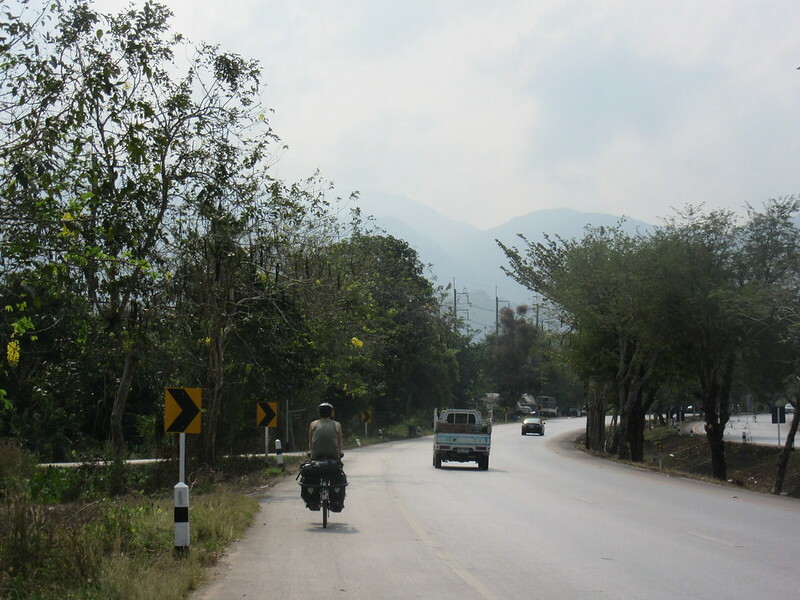 We only planned to ride to the next settlement on the map, which was Pong Nam Ron, another 30km away. Immediately we noticed the differences in Thailand. The roads were better, more road markings and signs (in that, there actually were some road markings, and some signs) and the cars were newer and shinier. By the roadside, there were many more shops, not just small market stalls. Seeing our first 7-11 was a nice moment, an air conditioned sanctuary full of cheap drinks, snacks and treats! The road continued to climb gradually, so we took our time, but soon we rolled into a town. In Pong Nam Ron we found a guest house and called it a day. There wasn’t much there, but we had a walk around the market and the few shops. Later we got stuck into a couple of bowls of noodle soup from a food cart, rounded off with an ice cream and a watermelon from the market. The next day, we weren’t really sure where we were heading, just south towards the coast. 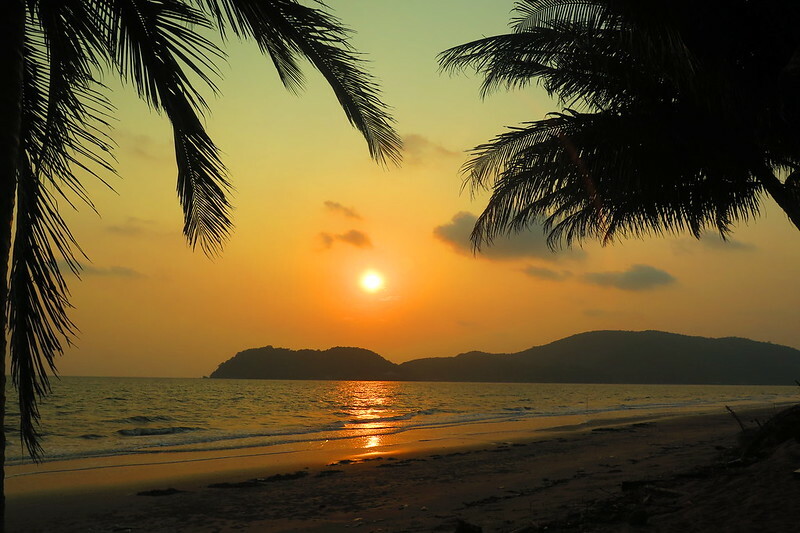 We’d hoped to hear from a Warm Showers host in Chanthaburi, but when we checked our emails in the morning, we hadn’t received a reply, so we had no set destination in mind. When we set off, we were immediately into a long downhill, our payback for the previous day’s slow climb. We more or less coasted for the first 15km and covered about 30km within the first hour. It was mid morning when we reached Chanthaburi, so we pulled over, had a coffee at a gas station and checked the map. We decided we could easily make it to the coast in a few hours, so let’s push on and get there. 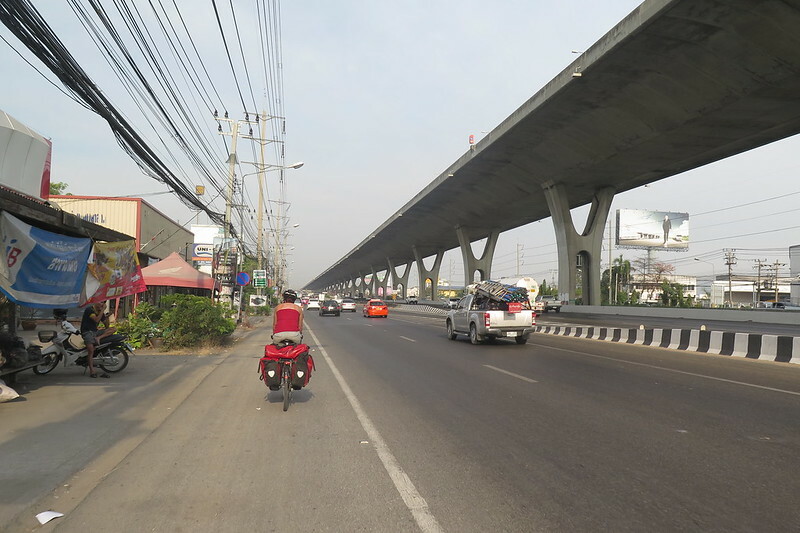 We briefly joined Route 3, the main coast road from Bangkok, but it wasn’t too busy and had a wide shoulder for cyclists and scooters. We weren’t on it for long, and soon turned off onto a minor road, heading down towards Laem Sing beach. There were a few clouds in the sky, and we had a cooler breeze coming off the sea, so we didn’t feel too hot riding in the middle of the day. 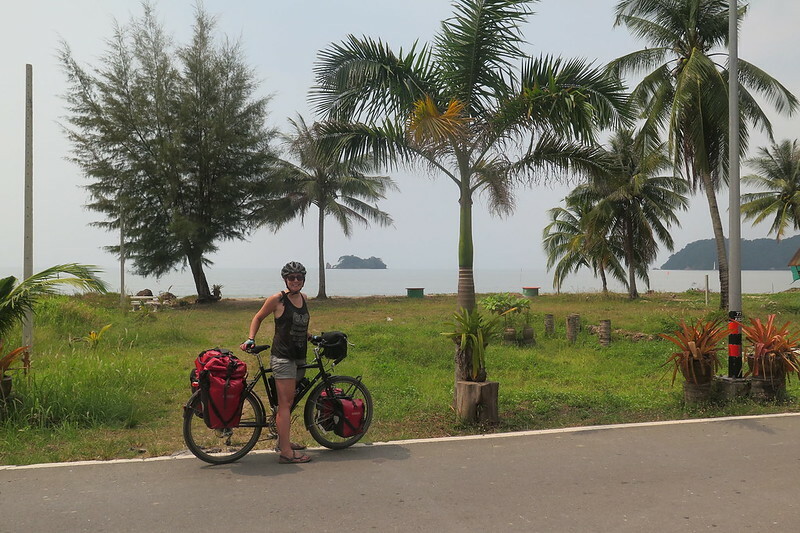 We reached the coast at Laem Sing, and turned right, following a quiet road running parallel to a narrow sandy beach. 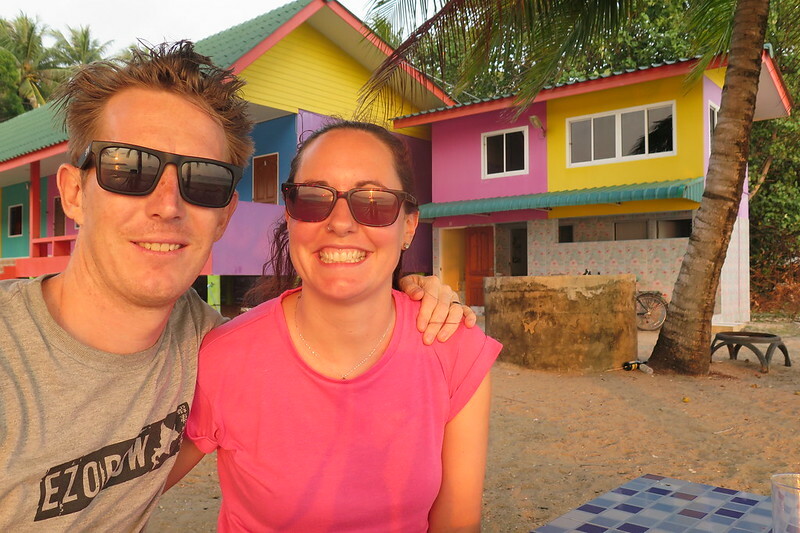 We found a little holiday resort area and got ourselves a little bungalow, right on the beach. I’m not sure if it’s low season, or just because it was mid-week, but we were the only people staying there. We spent the rest of the afternoon swimming and sunbathing then watched the sunset with a couple of beers. We weren’t going to be on the coast for long, but we were going to make the most of the time we had! With that in mind, we had a short day of cycling the next day. We hung around at our bungalow through the morning, going for another swim and just taking our time getting ready. We chatted to a group of Swiss, 2 guys and a girl, who pulled up in a van late the previous evening. They’d driven down here from Switzerland over the past year. It was interesting comparing our trips and the different challenges involved in each. Once we were finally underway, we took it very slowly! We had an iced coffee/smoothie break after about 10km, then lunch about 5km after that. It was mostly seafood on offer along the coast, which suited us perfectly, especially with the spicy and sour flavours that the Thais do so well. After lunch we hit the road again, but before long we were lured into another convenience store for ice cream. It felt a lot like a holiday. 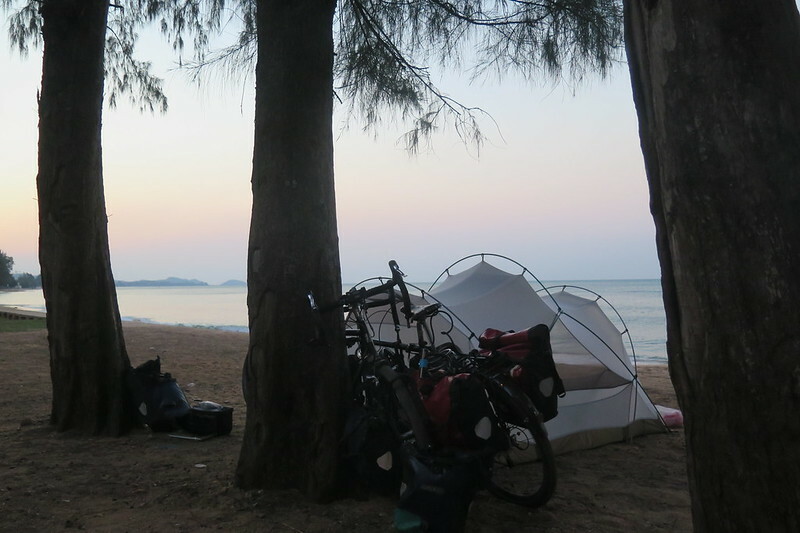 After a grand total of 29km for the day, we got to Chao Lao beach, on a small undeveloped headland. It was another afternoon of swimming, and then another sunset with a beer. 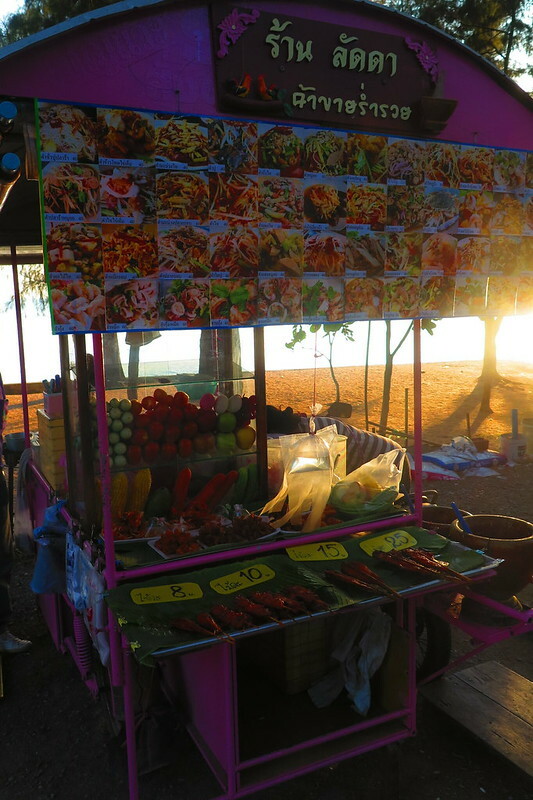 We got some dinner from a food cart and ate it sitting on a mat in the trees next to the beach. Then that night, for the first time in a very long time, we slept in the tent. We pitched our tent a little too close to the road though, as we had a constant stream of scooters pulling up, chatting for a while to their mates and then riding off, which went on until after midnight. We slept alright after that though, with just the sound of the waves in the background. We put a bit more effort into the following day, doing 90km to take us to the outskirts of Rayong. The policy of numerous stops for drinks and food was still in place though. As we’d camped, we got away quite early and made good time through the morning. We took the standard iced coffee and smoothie break at one of the many coffee shops beside the roads here in Thailand, and then later treated ourselves to a small pre-lunch beer on a terrace overhanging the beach. The roads we were riding really are perfect for cycling, with designated cycle lanes, and clear directions for cycle routes. We actually saw quite a few groups of cyclists on supported trips with support vans following behind them. Not a bad way of doing it! Lunch was a random hut next to the road, and yet another delicious meal, this time it was barbecued chicken and beef with rice. We followed the road, occasionally heading inland past numerous ponds which are fish and shrimp farms. 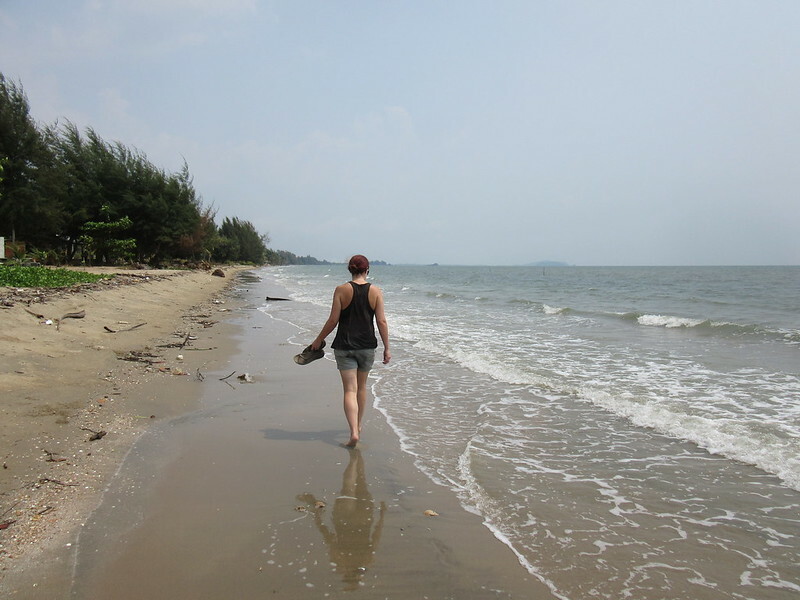 We passed Koh Samet island, just off the coast to our left and soon reached a wide, tree lined beach which looked perfect for another night under canvas. More swimming and relaxing through the afternoon before pitching our tent out of sight in the trees after sunset. We’ve now swapped over tents, opting for our slightly larger MSR tent. 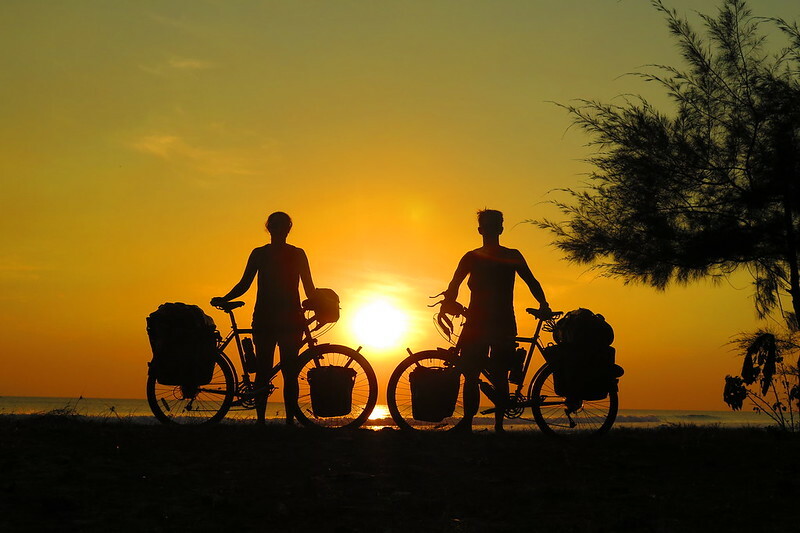 It’s designed for 3 and the extra room inside has been great not only to bring a couple of valuable panniers inside, but also in the heat it means we’re not stuck together and sweating like we were in our smaller MontBell tent. 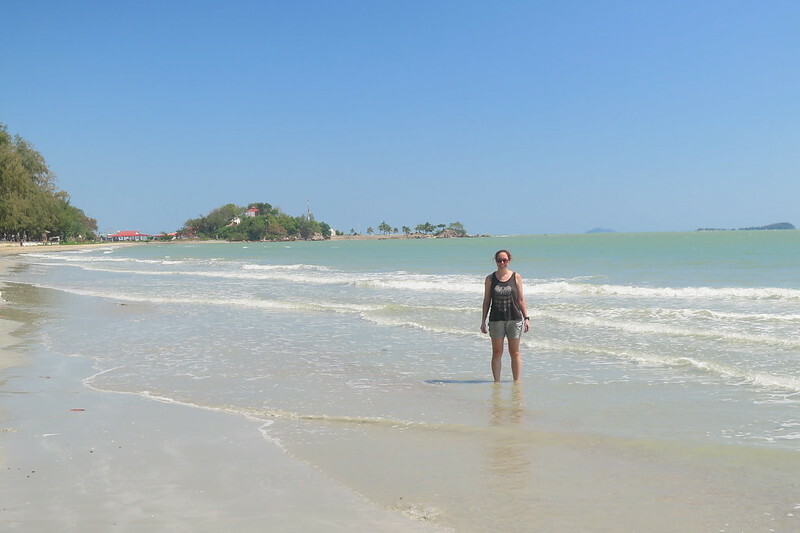 From Rayong we followed the coastline west, cutting the corner slightly as it turns to head north, then rejoined it just south of Pattaya. It was another decent day, 90km on the clock. The ride wasn’t as beautiful as previous days as we started hitting a few industrial areas. We also rode a few kilometres next to a group of fish sauce factories, with racks of fish lying out in the sun drying. The smell wasn’t great so we didn’t hang around. The wind from the north started picking up from midday, just as we were heading in that direction. After yet another delicious and cheap lunch, we joined busy Route 3 riding into the headwind, looking for a road to turn left onto that would take us to the coast. But all along the road were big resort hotels with private stretches of beach, which blocked us from getting to the sea. After quite a frustrating stretch, eventually we found an access road that got us to a beach road. It was still a very built up area, with a narrow beach on one side of the road, and hotels, restaurants and markets on the other. No possibility of camping here, so we found a room a couple of rows back from the seafront. This was definitely the tourist zone, and the prices reflected that, plus all the menus were in English and Russian. 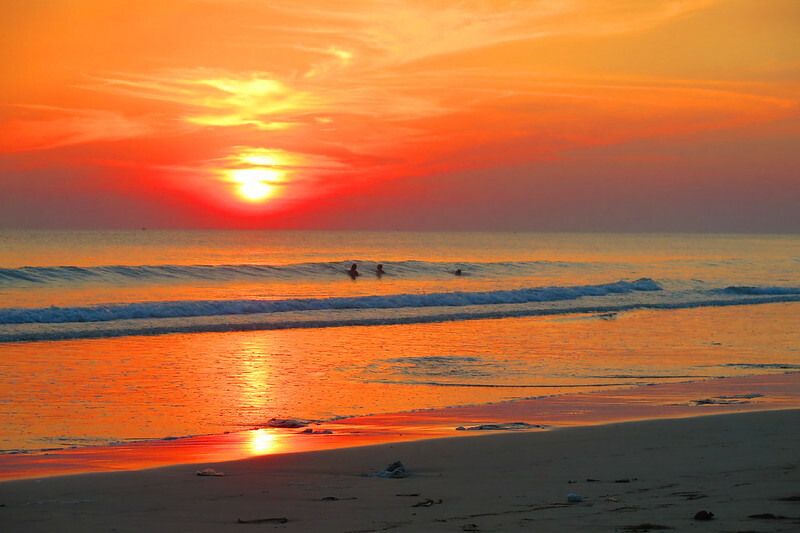 It was still a nice area, so we naturally went for the traditional afternoon swim and watched yet another beautiful sunset. The next morning, we set off north again and I realised that this is as far south as we’re going to be on this trip. Everything from here is north (and west.) It’ll probably be the last we see of the sea for a long long time too which is kind of sad. Depending on our route, the next time will be the Black Sea, or the Mediterranean, whenever that might be! 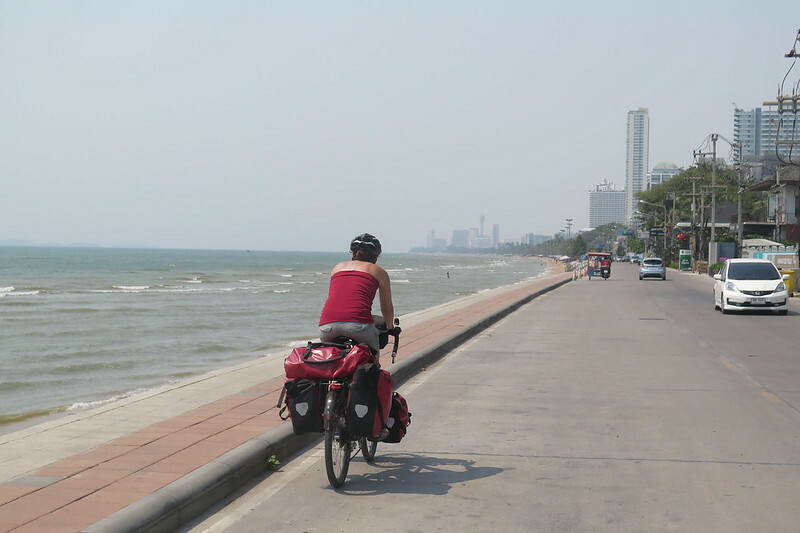 We passed straight through central Pattaya, which was interesting to say the least. The place has a certain reputation, and judging by what we saw, it looked to be deserved. Strip clubs, karaoke bars, ping pong shows and who knows what else lined the main strip. 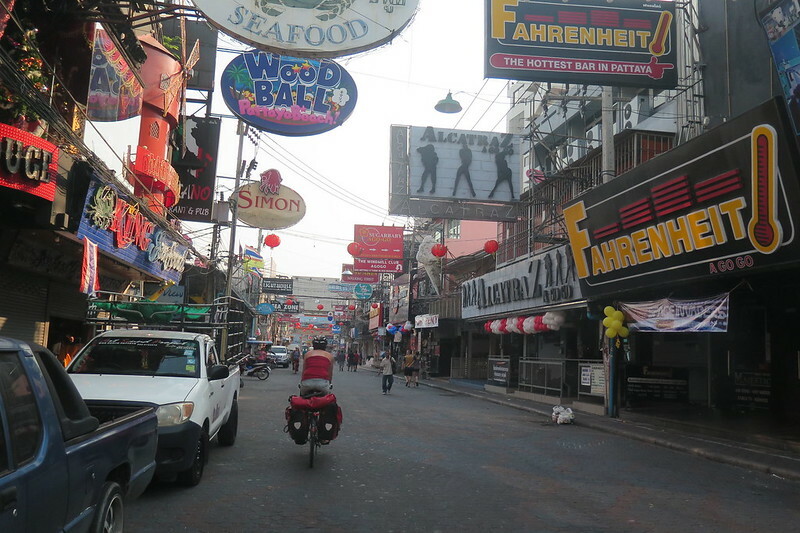 At night, I’m sure the bright neon lights and hustle and bustle would bring it to life, but as we cycled through at around 9 in the morning, it looked tired, seedy and felt almost hungover. We didn’t stick around, even though that meant rejoining Route 3, with all the other traffic bound for Bangkok. The headwind was still there slowing us down, but we pushed on and got some good distance behind us through the morning. It was a couple of degrees warmer too, as we were moving away from the sea. 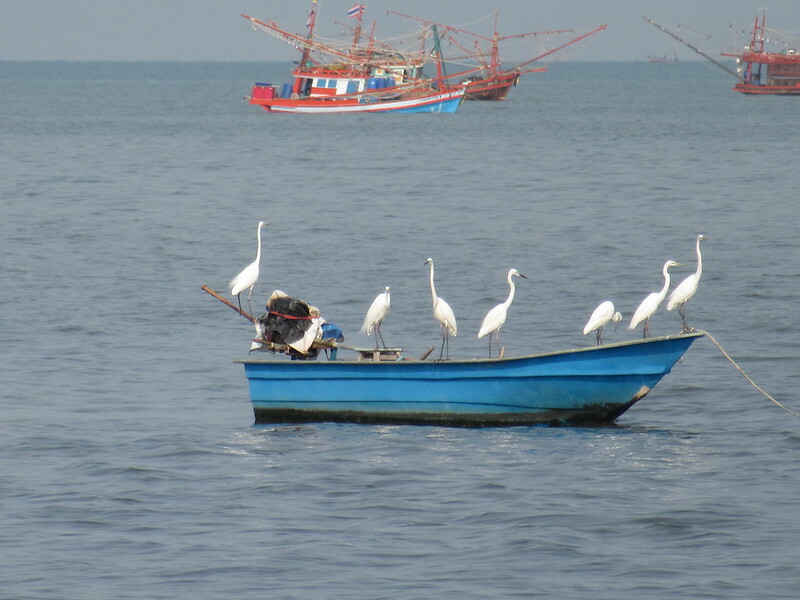 We passed Sri Racha town, famous for the rooster hot sauce, and stopped in Chon Buri for lunch. Another bowl of spicy noodle soup, perfect fuel for the ride. 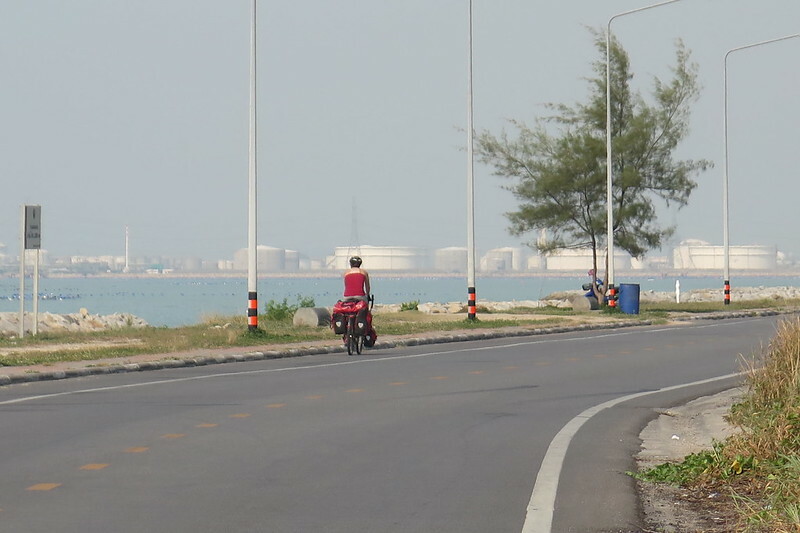 Just north of Chon Buri, the road widened and more traffic joined. It split into three sections, an overhead toll road, a central three lane expressway and then separated by a barrier, an additional three lanes on the left marked as the frontage road. We stuck as close as we could to the left, with all the other two wheeled traffic. 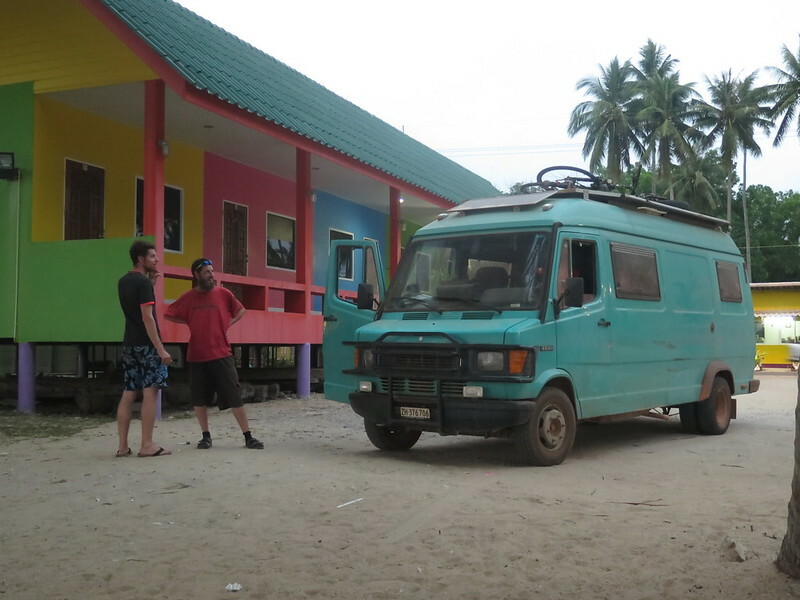 We assumed that as we were on a major route into Bangkok, there’d be accomodation options along side the road. But as the afternoon wore on and we ticked over 100km we still hadn’t seen anywhere we could stay. Camping would’ve been tricky too, as the road was bordered by factories and warehouses for most of the way. 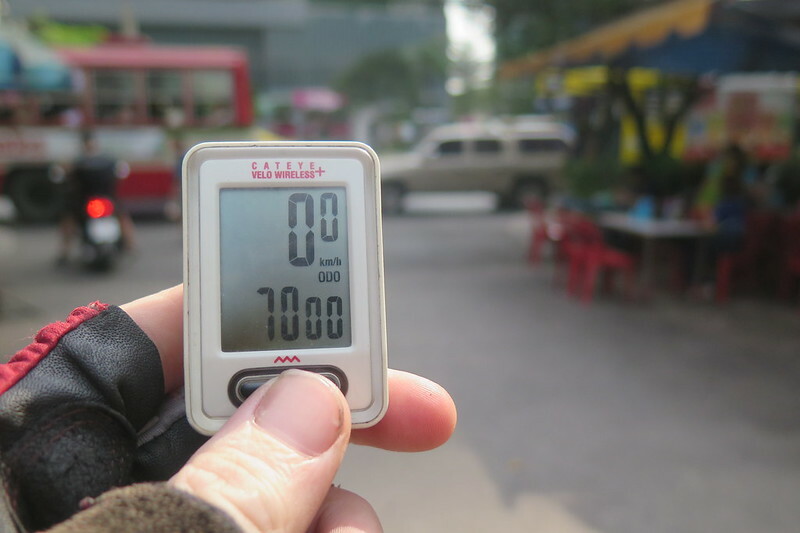 We pulled into a gas station at Bang Bo and asked there if they knew of any hotels nearby. They did the vague pointing thing, but couldn’t be more specific even when I asked if they could point out where on the map they meant. I headed off ahead and found a police station, where I asked again and they gave me better directions to a ‘resort hotel’. Gulp, sounded expensive. We found it, set a little way back from the road, and the price was 1,000 baht, or 20 quid. More than we’d wanted to pay, but beggars can’t be choosers, and after a long tough day, we didn’t mind paying up. Then when we saw what we were getting, a nice little lakeside villa and a swimming pool, we were really happy to spend the late afternoon and evening there before taking on the ride into downtown Bangkok the next day. 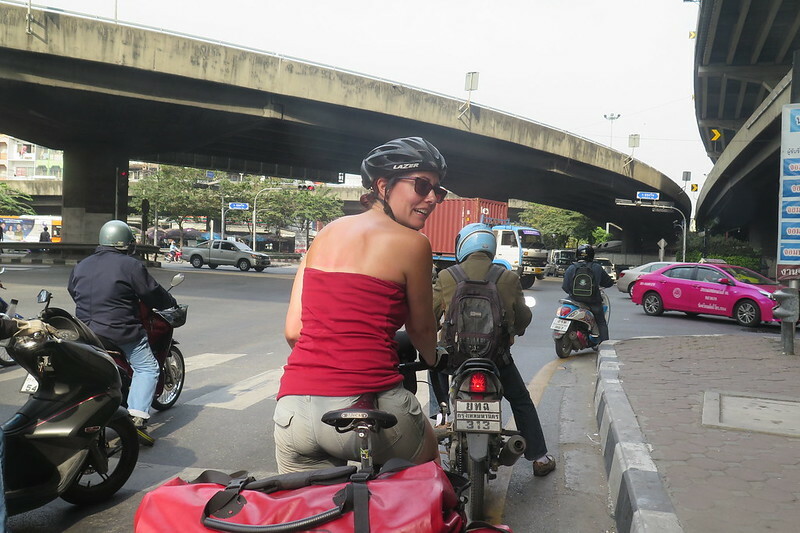 We’ve been to Bangkok before, and one of the main memories is of the chaotic traffic. So we were both slightly nervous about riding straight into the centre of the city. We left it a little later to leave, to hopefully avoid the worst of the rush hour, but of course it was still really busy. The frontage road on the edge of the expressway worked well for us, and the further we got into town, the other traffic slowed until we were more or less keeping pace with the vehicles around us. After 30km, we passed the next milestone, 7,000km total for the trip so far, so we pulled over for the obligatory photo. We still had another 20km to get us into the centre, so we pushed on in the traffic. We were off the main road and on the normal city streets now, which were often at a standstill with the stops at traffic lights sometimes lasting several minutes. To make any progress at all, we had to join the scooters in weaving through the gaps in traffic and filtering between lanes where we could. It was challenging, but actually quite good fun once we got into it. 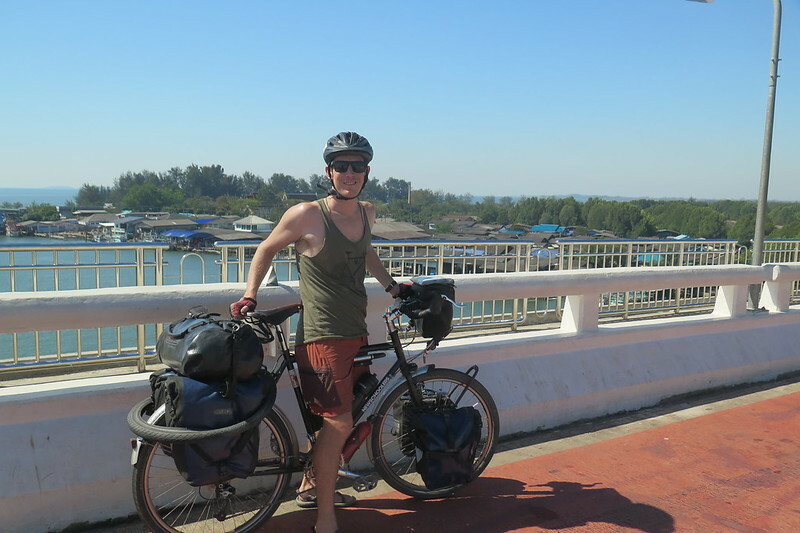 We made it to Hualamphong Station, where we’d booked a hostel for a couple of nights. 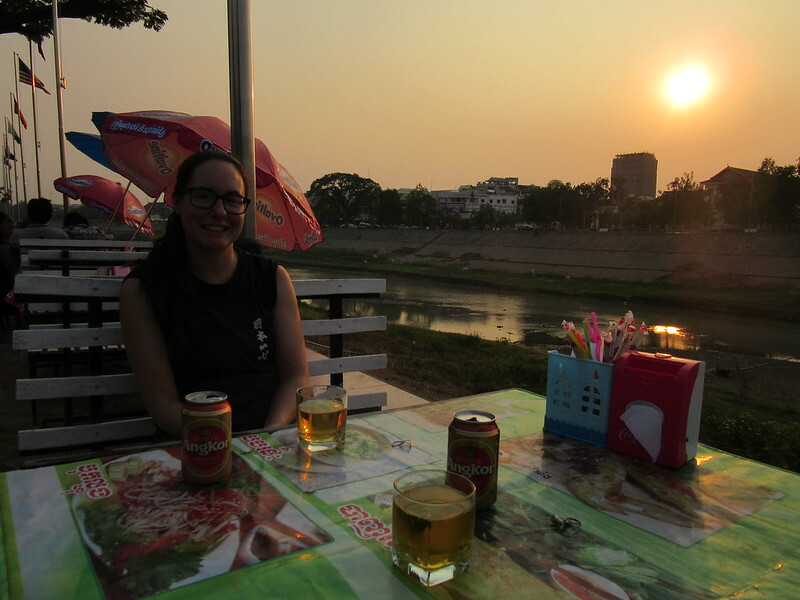 We spent the afternoon uploading photos and writing this blog, and also preparing the mountain of paperwork needed for our next China visa application. Now we’re in Bangkok and we’re going to spend a little while off the bikes. We’ll leave our bikes at a bike shop here to have them serviced while we catch the train up to Chiang Mai for a few days for Clare’s birthday. We really wanted to go there last time we were in Thailand but never made it. When we return, we’ll be setting off again to the north, towards Laos. 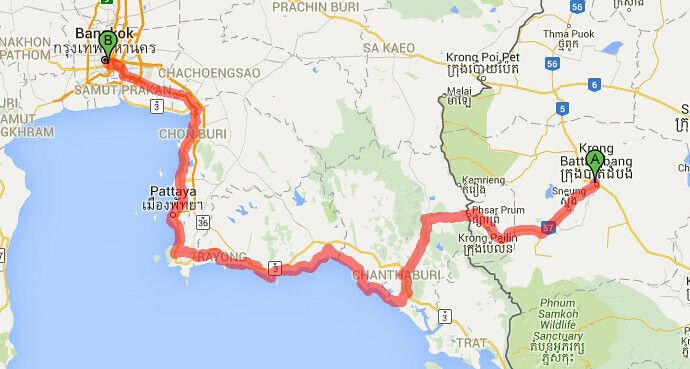 This is our route from Battambang in Cambodia, over the border and along the Thai coast to Bangkok. As Clare mentioned in her last post, we haven’t been raising money for charity for this trip. But, if you’ve enjoyed reading our blog, and fancy doing something nice, why not drop a few quid direct to Cancer Research http://www.cancerresearchuk.org Thank you.